You probably have a long list of questions about your Atrial Fibrillation. 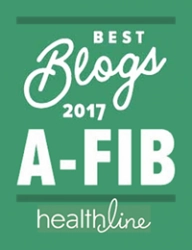 At A-Fib.com, we have answered thousands of patient questions—perhaps some of the same questions you may have right now. We’ve organized these questions and answers into several topics and treatment groups. Under FAQ about Living with A-Fib, we discuss Natural Therapies & Holistic Treatments. Here we focus on topics such as naturopathic doctors, complementary or integrated medicine as well as mind/body practices such as chiropractic, acupuncture, yoga and meditation. Some of the questions we answer: How do I find a doctor with a more “holistic” approach?, Is there any evidence on Yoga helping with A-Fib symptoms? and Do A-Fib patients find chiropractic adjustment useful? We also answer questions about whole food or organic diets, A-Fib and supplements, and the ‘vagal maneuver’. We invite you to browse through the lists of questions. To read more, just ‘click’ on the question to be taken to the answer page. After reading our post, FAQ: How Does High Altitude Affect Atrial Fibrillation?, Michele Straube shared some insightful comments about high altitude and A-Fib. Michele Straube had A-Fib for 30 years until her successful ablation. She is an active hiker including walking the Alps. 1. 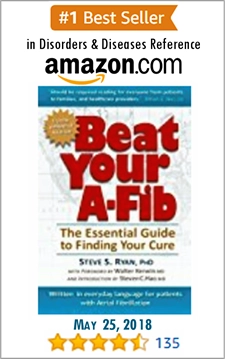 I was “cured” of A-Fib in 2009. In December 2015, my family climbed Kilimanjaro taking a longer route up so we had time to acclimate. While the rest of the family summited, I stayed at base camp (15,580′) because my heart was no longer in NSR [normal sinus rhythm]. It returned to NSR as soon as we got down to 12,000′ elevation. I admire Michele’s fearless attitude toward hiking and mountain climbing and her boldness in leading an A-Fib free life. Thanks, Michele, for sharing. To read Michele Straube’s story, go to ‘Cured after 30 years in A-Fib by Dr. Marrouche‘. Wondering if you Should Consider a Cox Maze or Mini-Maze for your A-Fib? What are your options when drugs aren’t working or you can’t tolerate them? When your symptoms are impacting your quality of life? And you want to cure your A-Fib not just manage it? Treatment options to consider include Catheter Ablation or Maze or Mini-Maze surgeries. In general, candidates for Maze or Mini-Maze surgeries are patients with significant, frequent A-Fib symptoms that do not respond to medication or catheter ablation. Patients who are unaware of their A-Fib symptoms are probably not candidates. However, each case is unique, so it’s best to discuss your options with your cardiologist. FAQ Update: For stroke prevention—warfarin (Coumadin), an NOAC or aspirin? For decades, people more at risk for A-Fib-related stroke have been on warfarin (Coumadin). In the last few years, many of these patients have switched to the newer NOACs. A-Fib patients with low or no risk factors for stroke are often put on aspirin, or nothing at all. —Continue reading—for the rest of our answer along with a few takeawys. • You are having other heart-related surgery. If you have to undergo open heart surgery for another heart problem, such as a Mitral Valve replacement, the Cox Maze operation can be performed concurrently with your other heart surgery. • You don’t qualify for a catheter ablation. If you can’t take blood thinners, for example, you can’t have an ablation. • You’ve already had a stroke. Or you are in danger of having a stroke during a catheter ablation. • You’re morbidly obese. It’s more difficult to see a clear image of the heart with current imaging systems during a catheter ablation if someone is significantly overweight. A word of caution—the Maze/Mini-Maze are surgical operations with the potential risks and complications of surgery. Surgery isn’t recommended as a first choice by current A-Fib treatment guidelines. The Maze surgeries are more invasive, traumatic, risky and with longer (in hospital) recovery times. In general, candidates for Maze or Mini-Maze surgeries, are patients with significant, frequent A-Fib symptoms that do not respond to medication or catheter ablation. Patients who are unaware of their A-Fib symptoms are probably not candidates. However, each case is unique, so it’s best to discuss your options with your cardiologist. To find the right electrophysiologist (EP) for you, see Finding the Right Doctor for You and Your A-Fib. 2014 AHA/ACC/HRS Guideline for the Management of Patients With Atrial Fibrillation: Executive Summary. A Report of the American College of Cardiology/American Heart Association Task Force on Practice Guidelines and the Heart Rhythm Society. Journal of the American College of Cardiology, Volume 64, Issue 21, December 2014. DOI: 10.1016/j.jacc.2014.03.021. http://www.onlinejacc.org/content/64/21/2246. An occlusion device, like the FDA approved Watchman., is used to close off the Left Atrial Appendage (LAA), the source of most clots (90%-95%) and A-Fib-related strokes. The Watchman is inserted in a very low risk procedure that takes as little as 20 minutes. Afterward, you would usually not need to be on a blood thinner (anticoagulant). Closure of the LAA is often included in a Maze/Mini-Maze surgery and sometimes as part of a catheter ablation. Side Effects: Closure of the LAA may compromise the ability of the Left Atrium to function fully. Serious athletes would probably miss the reduced blood flow from the left atrium. But most A-Fib patients would hardly notice. Long-Term Effects: What are the long-term effects of leaving a mechanical device like the Watchman inside the heart? We know that, after a few months, heart tissue grows over the Watchman device so that the LAA is permanently closed off from the rest of the heart. It seems unlikely that complications would develop after a long period of time (compared to long-term use of the blood thinner, warfarin). But we can’t say that for sure until enough time has passed. The first clinical trials installation of the Watchman device in the US was in 2009 and in Europe in 2004. So far, no long-term complications have developed. Other Occlusion Devices: Besides the Watchman from Boston Scientific, other occlusion devices include the Amplatz Amulet from St. Jude Medical and the LAmbre from LifeTech Scientific. EPs Installing the Watchman Device: To find EPs installing the Watchman or other occlusion devices, I highly recommend selecting an electrophysiologist (EP) who is certified in “Clinical Cardiac Electrophysiology”. For a list of EPs meeting this criteria, see Steve’s Lists of A-Fib Doctors by Specialty: Doctors Installing the Watchman. Reference Articles: To learn more about the removal of the LAA, and the Watchman, see my articles, The Role of the Left Atrial Appendage (LAA) & Removal Issues and The Watchman™ Device: The Alternative to Blood Thinners. There are a number of foods and supplements that are known to thin the blood. These include foods with high amounts of aspirin-like substances called salicylates, omega-3 fatty acids, vitamin E supplements, and foods with natural antibiotic properties. Healthy adults can greatly reduce the risk of blood clots and cardiovascular disease by modifying their lifestyle and adding nutritional supplements proven to support cardiovascular health. But this site is not recommending or advising that people switch from prescription anticoagulants to natural blood thinners. As of yet, there aren’t any double blind studies which demonstrate any natural alternative (or combination) is as effective against stroke as warfarin (Coumadin) or the new NOACs. Certain foods and supplements may be “natural” and thin the blood, but there’s little research on their effectiveness to prevent clots in those at high-risk for stroke, such as A-Fib patients. What’s more, there isn’t a way to track their effectiveness in the same way doctors can monitor the action of warfarin through routine blood tests. If considering a switch to natural blood thinners, do not stop taking your anticoagulation medication. Talk to your doctor first. Instead, you may want to seek out doctors who are holistically-minded and have knowledge of natural medicines; for example, a doctor who practices complementary or integrative medicine or a naturopathic physician. 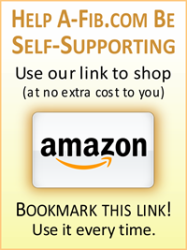 They can partner with you to pursue natural alternatives to prescription medicines. For a listing of such doctors in your area, go to http://www.ACAM.org. For additional advice on natural ways to prevent blood clots, visit www.drsinatra.com. Always talk to your doctor before adding any supplements to your treatment plan. Some ‘natural’ supplements may interact with your prescription meds (when taken alone or in combination) or interfere with coagulation and increase your bleeding risk. FAQ: “Which is the better to prevent A-Fib-related stroke—warfarin (Coumadin), a NOAC or aspirin? Updated: June 2018. For decades, patients more at risk for A-Fib-related stroke have been on warfarin (Coumadin). In the last few years, many of these patients have switched to the newer NOACs. A-Fib patients with low or no risk factors for stroke are often put on aspirin, or nothing at all. The FDA approved the NOACs without any recognized method of determining their clot preventing effectiveness (as with warfarin, i.e. INR). Warfarin has been successfully used for stroke prevention in A-Fib patients at high or intermediate risk for stroke. It’s readily available and inexpensive. Aspirin is no longer recommended as first-line therapy for Atrial Fibrillation patients according to the 2014 AHA/ACC/HRS Treatment Guidelines for Atrial Fibrillation. And has been downgraded to a class 2B drug. Microbleeds: We obviously don’t have any data on the long-term effects of taking NOACs for years. Some people on long-term warfarin have been known to develop micro bleeds and dementia. Will this happen with the NOACs? We simply don’t know. But intuitively one would expect the same thing to happen, though probably not to the extent of warfarin. Weighing the various risk/benefit ratios is a decision for you and your doctor. And should be re-evaluated as you grow older. FAQ: Are Anticoagulants and Blood Thinners the Same Thing? How do they Work? Since A-Fib increases your risk of clots and stroke, blood thinners are prescribed to prevent or break up blood clots in your heart and blood vessels and thereby reduce your chance of an A-Fib-related stroke. Although referred to as “blood thinners”, they don’t actually affect the “thickness” or viscosity of your blood. There are two main types: anticoagulants and antiplatelet agents. They work differently to accomplish the same end effect. Anticoagulants work chemically to lengthen the time it takes to form a blood clot. Common anticoagulants include warfarin (Coumadin), Heparin and the NOACs such as apixaban (Eliquis). Antiplatelets prevent blood cells (platelets) from clumping together to form a clot. Common antiplatelet medications include aspirin, ticlopidine (Ticlid) and clopidogrel (Plavix) . Final answer: An anticoagulant doesn’t really thin the blood or make it less viscous, but it does help prevent a stroke like blood thinners do. Note: To read about ‘clot buster’ drugs or treatments that could save you from a debilitating stroke, see my article: Your Nearest ‘Certified Stroke Center’ Could Save Your Life. FAQs: Normal or Enlarged Left Atrium—What does it Mean? “How do I know if I have an enlarged left atrium and what does it mean, if it is? What is the size of a normal left atrium? When in A-Fib, your left atrium has to work harder than normal and tends to stretch and dilate over time. Obstructive sleep apnea (OSA) and high blood pressure can also contribute to an enlarged left atrium. Consequences of an Enlarged Left Atrium: One study showed that Persistent A-Fib was associated with left atrium size (but not the number of years that a patient had A-Fib). Left atrium size has been found to be a predictor of mortality due to both cardiovascular issues as well as all-cause mortality (although other factors may contribute). As a result, some medical centers won’t do a Pulmonary Vein Ablation (Isolation) procedure if the left atrium is enlarged (over 5.5 cm). However, with the newer ablation techniques, other centers will. Surgeons also are reluctant to operate on someone with an enlarged heart. Why You Need to Know Your Measurement: If you’ve had A-Fib for a while with significant symptoms, we often advise you to ask your doctor for this measurement to see if your left atrium is enlarged. This will be your benchmark for future comparison. It will be described in either centimeters (e.g. 2.0 cm) or millimeters (e.g. 20 mm). Note: Indexing the left atrial volume to body surface area* (BSA) is recommended by the American Society of Echocardiography and the European Association of Echocardiography. * BSA=body surface area. • Margolese, R G, et al. Cancer Medicine (e.5 ed.). Hamilton, Ontario: B.C. Decker. ISBN 1-55009-113-1. Retrieved 27 January 2011. • Allen NE, et al. (March 2009). “Moderate alcohol intake and cancer incidence in women”. Journal of the National Cancer Institute. 101 (5): 296–305. doi:10.1093/jnci/djn514. • Lang RM, et al. “Recommendations for chamber quantification”. European Journal of Echocardiography. (2006) 7 (2): 79–108. PMID 16458610. doi:10.1016/j.euje.2005.12.014. Retrieved 2012-08-26. FAQ: How Does High Altitude Affect Atrial Fibrillation? To begin, know that the lower oxygen environment of high altitude affects everyone, at least at first. Your body must make certain physiological adaptations. This is particularly obvious at very high altitude (9000+ feet). Oxygen levels are approximately 40%-45% less dense and feel like “thin air”. Heart rate speeds up, increased adrenaline circulates in our bodies. The low moisture content in the atmosphere causes dehydration (50%-60% lower than at sea level). Even healthy individuals often feel shortness of breath and fatigue. If physically active, conditioned and in shape, A-Fib patients without symptoms should generally be fine at high altitude (depending on concomitant other heart conditions). Patients whose atrial fibrillation is stable without symptoms should generally be fine at high altitude. For patients with episodes of atrial fibrillation, the stressors of high altitude may (or may not) be a trigger. For those patients who have been cured of A-Fib, the risk of high altitude shouldn’t be much different from normal healthy persons. When going to a high-altitude location, check with your doctor before hand. Your doctor may suggest that you rest and lower your normal activity level for several days after arriving at the high altitude. In addition, it would be wise to have a plan for medication adjustment. For example, if on rate-control drugs, your doctor may want to up the dosage. For A-Fib patients, altitude and lower oxygen levels will affect your breathing and put a strain on your pulmonary veins where most A-Fib originates. Adaption is key. Allow at least a couple of days of lower than normal activity level. The key is gradual adaption. Before strenuous hiking or exercising in high altitude, allow at least a couple of days of lower than normal activity level. To adjust to low moisture content and escape dehydration, hydrate well. Alcohol consumption should be minimized. Also, watch for any new or unusual signs or symptoms of your a-Fib or of altitude sickness. Reader comment: Michele Straube shared some insightful comments about high altitude and A-Fib. Michele Straube had A-Fib for 30 years until her successful ablation. She is an active hiker including walking the Alps. 1. 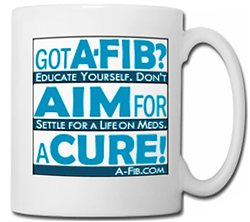 I was “cured” of A-Fib in 2009. In December 2015,, my family climbed Kilimanjaro taking a longer route up so we had time to acclimate. While the rest of the family summited, I stayed at base camp (15,580′) because my heart was no longer in NSR [normal sinus rhythm]. It returned to NSR as soon as we got down to 12,000′ elevation. 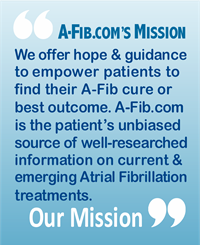 For over a decade of publishing A-Fib.com, we have answered thousands of patient’s questions—many times the same questions. Perhaps the same questions you may have right now. For more questions and answers in a number of categories, visit our FAQ pages. Levine BD. Going High with Heart Disease: The ,of High Altitude Exposure in Older Individuals and Patients with Coronary Artery Disease. High Alt Med Biol. 2015 Jun;16(2):89-96. doi: 10.1089/ham.2015.0043. Epub 2015 May 21. PubMed PMID: 26060882. Raymond F. Stainback, MD. FAQ: Does high altitude have a negative effect on A-fib patients? Texas Heart Institute. 05/06/2016https://www.texasheart.org/heart-health/heart-information-center/frequently-asked-patient-questions/does-high-altitude-have-a-negative-effect-on-a-fib-patients/. New FAQ: Which antibiotics are less liable to cause an A-Fib attack? From another EP: “Most [antibiotics] do not change the way the heart’s electrical system functions other than prolonging the QT interval, which should have the opposite effect. In the quinolone family, (antibiotics) like Levofloxacin and Ciprofloxacin act like antiarrhythmics. After reading our page about Catheter Ablation: Pulmonary Vein Ablation, you may have many questions. At A-Fib.com, we have answered thousands of questions from A-Fib patients—many of the same questions you may have. In the realm of catheter ablation, the range of issues and questions can be staggering. Topics including RF energy vs Cryo, enlarged heart and heart failure, PV vs non-PV potentials/triggers, recurrences, O.R. Reports and many more. • Blanking Period: “How long before you know a Pulmonary Vein Ablation procedure is a success? • Non-PV Triggers: “Are there other areas besides the pulmonary veins with the potential to turn into A-Fib hot spots? • A-Fib cure? “I’ve read that an ablation only treats A-Fib symptoms, that it isn’t a ‘cure’. Additional topics we cover: the heart’s blood pumping capacity, the age range for a successful ablation, time length of a typical ablation, developing a clot during an ablation, resuming ‘normal’ exercise after a PV, who’s a candidate for a Pulmonary Vein Ablation, and more. Go to FAQ About A-Fib Treatments Options: Catheter Ablation Procedures to browse all our posted questions and ‘click’ on any question to jump to the answer. For all our Q & A lists, go to our page Frequently Asked Questions (FAQs) by Patients with Atrial Fibrillation. FAQ: Which antibiotics can cause an A-Fib attack? To answer these questions, I turned to members of our world-wide A-Fib.com Advisory Board. Several EPs shared their opinions, research data and insights from their practices. Another EP wrote: “Most antibiotics are well tolerated by patients with A-Fib. It’s much more likely that the underlying infection or illness causes A-Fib rather than the antibiotic used to treat it. At this time, we can’t identify antibiotics that cause or trigger A-Fib in most patients. According to most authorities in the A-Fib field, an A-Fib patient’s negative reaction to a particular antibiotic is most likely an individual idiosyncratic response rather than a generalized, population-wide phenomenon. I am deeply indebted to these cardiac electrophysiologists and others who offer me their counsel in publishing A-Fib.com. When I have a tough question, I can button hole them at a medical conference, send an email, or telephone them. While not always agreeing with all my positions, these doctors try to point me in the right direction. It is my honor to acknowledge and thank the world-wide members of the A-Fib.com Advisory Board. For a list of members, go to the A-Fib.com Advisory Board. FAQ: Does Your Information About Atrial Fibrillation Apply to A-Flutter, As Well? Consider Atrial Flutter as a milder, more organized form of A-Fib. However, because Flutter is more organized and regular, it often makes the ventricles beat faster. Sometimes it’s harder to control the pulse rate of Flutter compared to A-Fib. During a catheter ablation for A-Fib, as the electrophysiologist (EP) ‘isolates’ A-Fib areas, the patient’s heart often progresses or improves into Atrial Flutter, then into tachycardia, and finally into normal sinus rhythm (NSR). • Atrial Flutter: Comes from the right atrium and is easily isolated by what is called a ‘Caviotricuspid Isthmus line ablation’ of the right atrium. This is a very simple procedure which can take as little as 10 minutes to complete. It’s often done in addition to an ablation for Atrial Fibrillation either before or after leaving the left atrium. • Atypical Flutter: A second type is often called “atypical Flutter.” At the end of a more complex catheter ablation, sometimes a patient remains in ‘atypical’ Flutter. This Flutter circuit can be difficult to map and isolate and is often one of the hardest arrhythmias to find and fix. Often when I talk with patients with atypical flutter, I recommend them to Master EPs who have special mapping and ablation skills and more experience. 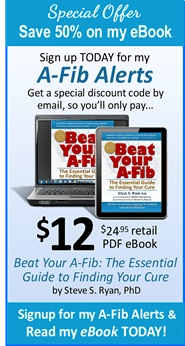 Almost every article on A-Fib.com can also relate to Atrial Flutter. It’s true, we often don’t mention Atrial Flutter specifically. But Atrial Flutter is often related to and can be a form of Atrial Fibrillation. In fact, a patient’s Atrial Flutter may mask that they also have Atrial Fibrillation. Likewise, as many as half of all patients who have an ablation specifically for Atrial Flutter, later develop Atrial Fibrillation. For more, read my article: Atrial Fibrillation and Atrial Flutter: Cause and Effect? New FAQ: Will EECP Heart Therapy Help my Circulation? The goal of Enhanced External Counterpulsation (EECP) therapy is to improve the flow of healthy, oxygenated blood to the heart. It works by opening or forming small blood vessels called collaterals which create natural bypasses around blocked arteries. It’s FDA cleared, non-invasive, requires no medication and has no recovery period. It improves circulation and decreases inflammation. Ischemic means a restriction in blood supply to tissues caused by constriction or obstruction of the blood vessels. EECP has been used with patients suffering from ischemic heart diseases (e.g. angina and heart failure). In addition, if you have high blood pressure, EECP can decrease arterial stiffness and hardening of the arteries. It also pumps blood into bone marrow and pushes stem cells to secrete into the circulatory system. I recently had an EECP session at Global Cardio Care–West Los Angeles, CA. I can testify that EECP therapy is very powerful and invigorating. In my case, they found that my arteries were very flexible, so I didn’t get as much benefit as someone with clogged arteries. I can testify from personal experience that EECP feels very effective. It seems like a naturally occurring bypass. (Global Cardio Care, Inc. has two locations in Los Angeles and offers a free session, see their website). During an EECP therapy session, you lay on an EECP bed with a pulse-oximetry device on your finger and hooked up to a 12-lead ECG. Heavy-duty air compression pressure cuffs (similar to blood pressure cuffs) are wrapped around each calf, thigh, and the buttocks. The ECG signal synchronizes the sequential squeezing of the cuffs to the rhythm of the patient’s heartbeat. When the heart is at rest, the blood pressure cuffs squeeze the blood from the lower legs and circulate it throughout the entire arterial system. When the heart pumps, the cuffs deflate rapidly. EECP therapy increases the blood flow and oxygen back to the heart, reducing the work that the heart has to do. It also improves circulation and strengthens the cardiopulmonary system. A typical session lasts around 1 hour; one course of EECP is usually 35 hours. This increased and powerful circulation to the arteries helps develop “collaterals”―new arteries for blood to flow through. Hormones and vasodilators (nerves that cause widening of blood vessels) are released. Within the arteries, nitric oxide and Vascular Endothelial Growth Factor (VEGF stimulates the formation of blood vessels) are secreted which help the process of collateralization (forming a side branch of a blood vessel). This improves arterial stiffness, increases circulation, and decreases inflammation. When I interviewed Sara Soulati of Global Cardio Care, Inc., she shared her experiences with Atrial Fibrillation patients seeking EECP. (Global Cardio is where I had my EECP session.) She recalled how her first A-Fib client came from a referral from Dr. Julian Whitaker (Whitaker Wellness Institute in Newport Beach, CA). Her insights and advice come after conducting EECP on more than 60 A-Fib patients. “About 20% of our clients have had their A-Fib converted back into normal sinus rhythm.” Sara Soulati of Global Cardio Care, Inc. Criteria for Best Results: She learned that in order to conduct EECP on someone with A-Fib, one of the criteria for a successful outcome is to have controlled A-Fib as opposed to unstable A-Fib. Uncontrolled A-Fib has a wider range of heart rates, for example 40 to 150 beats per minute which makes the heart rate very irregular. Whereas controlled A-Fib has a narrower range of heartbeat (50-70 beats/minute). This allows EECP to work properly, since EECP is triggered by the resting phase of the heartbeat. EECP Results for A-Fib Patients: Sara Soulati hypothesizes that EECP stimulates electrical conduction of the SA Node to start to conduct and to normalize electrical conduction. For those who don’t return to sinus, their heart rate often becomes more controlled and medications can be decreased. EECP is FDA cleared for the following conditions: angina pectoris, congestive heart failure, cardiogenic shock, and acute myocardial infarction. Medicare (and many private insurers) will reimburse for several courses of EECP if you meet the criteria. Other diseases or conditions mentioned have been studied in clinical trials. Clinical research shows there is, in fact, improvement in these disease types with EECP treatment. Medicare will reimburse for several courses of EECP if you meet the criteria. Most private insurance companies have coverage policies similar to Medicare. We advise you to talk to your cardiologist or EP before proceeding. Where can I Find Centers Offering EECP Therapy? There are nearly 1,000 academic medical facilities, physician practices and stand-alone centers offering EECP throughout the world and in the U.S. See “Locate EECP®Therapy Centers” at the VasoMedical EECP Therapy website. Get Pumped Up With EECP by Julian Whitaker. Whitaker Wellness Institute, Medical Center. A course of EECP therapy may offer a way to improve the flow of healthy, oxygenated blood to your heart. As Sara Soulati of Global Cardio Care, Inc. reports, with EECP therapy, about 20% of her A-Fib clients have converted back into normal sinus rhythm. The criteria: if your A-Fib is controlled within a narrower range of heartbeat (50-70 beats/minute), or if you have paroxysmal (occasional) A-Fib, you may want to look into a course of EECP therapy. It can improve cardiac function and possibly decrease the need for A-Fib meds. Sara Soulati, Global Cardio Care, Inc.,. https://globalcardiocare.com/sara-soulati-health-for-life-program. Graphic of EECP Animation: from Renew Group Private Limited YouTube video. https://www.youtube.com/watch?v=zPJwAIXfP1E. Published Jul 24, 2016. www.renewgroupecp.com. I’ve answered a question from Ryan Farhat who asked an important question about taking over-the-counter decongestants. Though it can relieve symptoms, a decongestant doesn’t speed your recovery. The Problem: When taking a decongestant, heart rate and blood pressure go up, the heart beats stronger, blood vessels constrict in nasal passages reducing fluid build-up. For A-Fib patients this can trigger or induce their Atrial Fibrillation. The main active ingredient in many decongestants (e.g. Sudafed Congestion) is pseudoephedrine, a stimulant. It is well known for shrinking swollen nasal mucous membranes. A Safe Substitute? A substitute for pseudoephedrine is phenylephrine. In general, phenylephrine is milder than pseudoephedrine and also less effective in treating nasal congestion. As with other decongestants, it causes the constriction of blood vessels and increases blood pressure. There is anecdotal evidence that products with phenylephrine (e.g. Sudafed PE, Dimetapp and Triaminic) might be less of a trigger for A-Fib than pseudoephedrine (e.g. Sudafed). Many medicines combine an antihistamine and decongestant, like Allegra-D, Benadryl Allergy Plus Sinus, Claritin-D, and Zyrtec-D. The “D” means it has a decongestant. Antihistamines reduce the effects of histamine in the body which can produce sneezing, runny nose, etc. Though they can lessen your symptoms, some can aggravate a heart condition, or be dangerous when mixed with blood pressure drugs and certain heart medicines. Compared to decongestants, antihistamines are often better tolerated by people with A-Fib. Examples are Claritin (loratadine), Zyrtec (cetirizine), Allegra (fexofenadine), and Coricidin HBP (chlorpheniramine maleate) but it also contains acetaminophen and a cough suppressant. Note: “Claritin-D” also has a decongestant. I don’t know of any decongestants that are safe to take when you have A-Fib. One possible exception are those with the active ingredient phenylephrine (e.g. Sudafed PE, Dimetapp and Triaminic.). Antihistamines and decongestants can give much-needed relief for a runny or congested nose. But A-Fib patients should pay attention to the warnings for heart patients. Best Advice: Consult your cardiologist or EP for the best option for your stuffy nose or allergies. And ask about interactions with your other heart medications (especially if you have high blood pressure). The various medications or drugs for treatment of Atrial Fibrillation can be overwhelming. What they are for, how they work and how they might affect you, can be confusing. After reading our page Treatment/Drug Therapies, you may still have unanswered questions (perhaps the same others have asked). We may be able to address your concerns in our Q&A section, Drug Therapies and Medicines (under FAQ: Living with A-Fib). We provide answers to the most frequent inquiries by patients and their families. • I’m worried about the toxic side effects of amiodarone. What should I do? Go to Drug Therapies and Medicines to browse all our questions. You’ll find more answers to questions about therapy, such as about warfarin and Coumadin, foods with Vitamin K, Electrical Cardioversion, aspirin and stroke prevention, and natural blood thinners. We invite you to browse through all our categories of answered questions. Go to -> FAQs: Coping with Atrial Fibrillation. In Layman’s Terms: What is Post-Ablation ‘Recurrence’? “Recurrence” or “Re-connection” is a general term electrophysiologists (EPs) use to describe when A-Fib returns after a successful catheter ablation. Heart tissue is very tough and resilient. There is a tendency for ablated heart tissue to heal itself, regrow the ablated area, reconnect, and start producing A-Fib signals again. But if this happens, it usually occurs within approximately the first three to six months of the initial catheter ablation. This type of recurrence may happen because the heart tissue was not originally ablated properly, the burn lesion may not have been deep enough (transmural). The Social Security Administration Blue Book lists the disabilities that qualify for benefits. Of interest to patients with Atrial Fibrillation is Sec. 4.05 which lists A-Fib at “Cardiovascular” under “Recurrent Arrhythmias”.